TYPICALLY MADE TO ORDER OR IN SMALL BATCHES. Our pistons incorporate features that others charge premiums for. Many of our competitors offer pistons "exclusive" to their name. Their pistons are often only slightly tweaked, "off-the-shelf" versions from said manufacturer. This is done to reduce their cost and speed up "development." 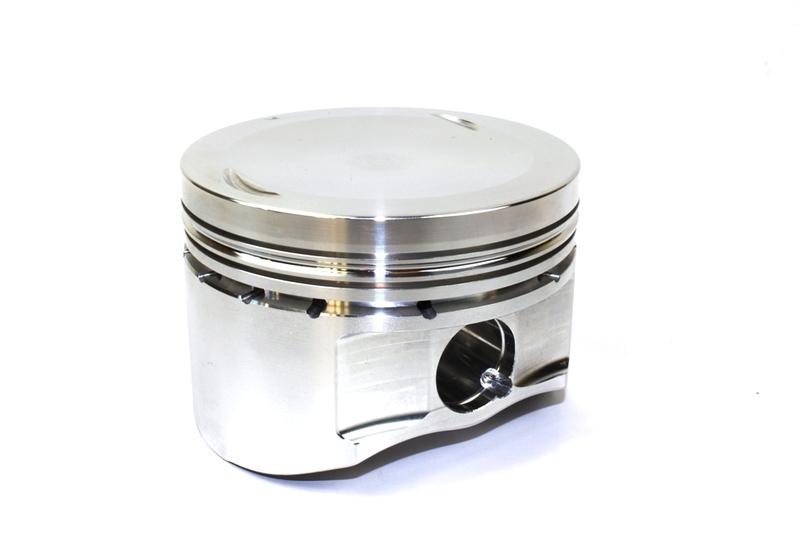 Our pistons showcase years of knowledge and experience from experts in the Domestic and BMW race fields, making them a truly engineered piston. Some would call our pistons "over engineered," but why not when it doesn't come with a premium price! Our M30 Turbo pistons use a spherical dish instead of the common 360 dish. You will notice the picture on the right shows the difference between our pistons (on the left) versus a competitors "generic" brand name M30 turbo piston. You can see that the dish of the Miller piston gradually deepens towards the center of the piston while the piston on the right abruptly tappers down and remains flat through the rest of the dish. The spherical dish accomplishes a couple things. The squish area around our piston makes the combustion process more efficient which increases power and torque and it helps reduce the risk of detonation. The spherical design also provides better strength around the edge of the piston where a typical 360 Dish pistons often have stress related failures. Another standard feature found on our pistons is the double pin oilers with banana groves. This feature is rarely found on others "generic" pistons and helps increase lubrication on top of the wrist pin. Turbo engines are harder on wrist pins than N/A engines and the extra lubrication ensures better longevity. Another feature usually charged as a premium is to offset the pin boss. This helps reduce any piston noise and increases the pistons life. Our pin bosses are also honed to maintain a very low RA. This low RA further helps reduce wear and any chance of clearance growing which can sometimes be found on generic pistons with high RA finishes. This feature is sometimes found on competitor's pistons but not always. The accumulator grove between the first and second ring help reduce the pressure between the 1st and 2nd ring. This again, improves the longevity of the piston and reduces the risk of pinching a ring. Our wrist pins included with our pistons are machined from 4130 Chrome Moly. Unlike other wrist pins that are rolled, our machined pins offer far greater strength and durability. Our wrist pins also feature a machined chamfer which is a superior method used to prevent the lock from ever popping out.